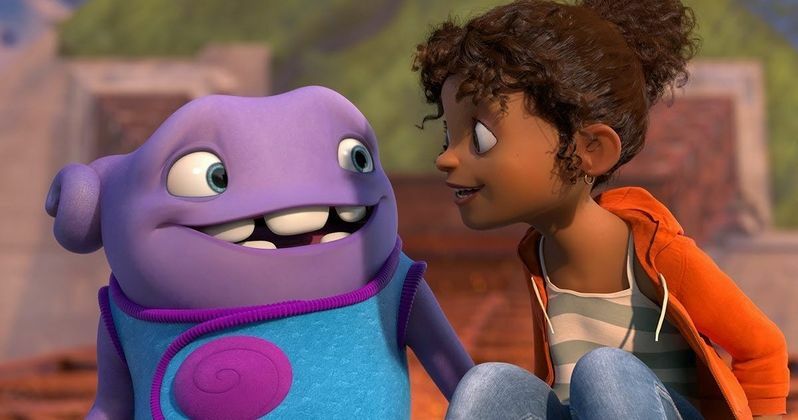 Five months after the first trailer debuted back in June, DreamWorks Animation is giving fans another glimpse at Home with the second trailer, starring voice actors Jim Parsons and Rihanna. When Earth is taken over by the overly confident Boov, an alien race in search of a new place to call home, all humans are promptly relocated, while all Boov get busy reorganizing the planet. But when one resourceful girl, Tip, (Rihanna, who also contributes a song) manages to avoid capture, she finds herself the accidental accomplice of a banished Boov named Oh (Jim Parsons). The two fugitives realize there's a lot more at stake than intergalactic relations as they embark on the road trip of a lifetime. If the second trailer wasn't enough, we also have two more videos where Rihanna teaches Jim Parsons how to take the perfect selfie, and another where the co-stars interview each other.